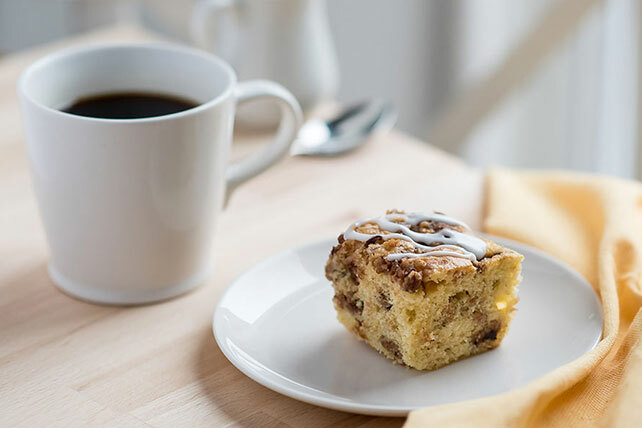 Chopped chocolate chip cookies are added to yellow cake mix batter and topped with a coconut, pecan and cinnamon streusel in this luscious coffee cake. Chop 20 cookies; set aside. Finely crush remaining cookies. Prepare cake batter as directed on package. Add sour cream; mix well. Stir in chopped cookies; pour into 13x9-inch pan sprayed with cooking spray. Combine cookie crumbs, nuts, coconut, brown sugar and cinnamon in medium bowl; stir in butter until blended. Sprinkle over batter. Bake 40 min. or until toothpick inserted in center comes out clean. Cool completely. Mix powdered sugar and milk until blended; drizzle over cake. Let stand until glaze is firm.